Marvel’s Agents of S.H.I.E.L.D., which arguably had its best season last year, has been lull on when it’s 5th season would premiere. It’s been known for some time that the show would return after the inaugural season of Marvel’s Inhumans sometime in early 2018. However, it’s now announced when the two-hour premiere for the 5th season of the show would happen. The Agents of S.H.I.E.L.D. cast was at New York Comic-Con this year where they unveiled the premiere date for the show will be this year on Friday, December 1st. Given how awesome last season was, it’s surprising that ABC wanted to cancel the show (needing Disney to step in to save the show), but the show will instead be relegated to the “Friday Night Death Slot.” That doesn’t mean it’s a bad thing as shows like Fringe, Constantine, and Crazy Ex-Girlfriend managed to pull in great ratings on that night, and with Agents of S.H.I.E.L.D.’s built-in audience, it’ll be fine on Friday Nights. The first 20 minutes of the season premiere was also shown for Comic-Con audience as well as well as a few tidbits revealed at the convention. The Kree, the alien race responsible for the creation of the Inhumans for their intergalactic warfare purposes (in the comics for their war with the shape-shifting aliens: The Skrulls, who will be entering the Marvel Cinematic Universe in 2019’s Captain Marvel film), will be making their return next season. Ghost Rider, who was introduced last season (and was awesome) may possibly return as well. His role was reduced towards the latter part of the 4th season as his superpowers ate up a chunk of the show’s special effects budget. The Monolith, the artifact that allows people to transport across space will be making a return as well. It will be used to transport Coulson and the gang to the “space jail” we saw in the Season 4 cliffhanger. S.W.O.R.D., the intelligence agency that deals with extra-terrestrial threats will not be in the 5th season of the show. 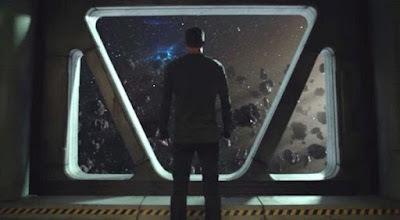 With the 4th season finale had Coulson in “space jail” and fans figured out that S.W.O.R.D. was responsible for it. However, Comicbook.com reports that S.W.O.R.D. may not be around because it’s a right’s issue (that old, “who owns what Marvel characters” troupe). So the mysterious “Men In Black” from the finale may be some other group altogether. A new “Star-Lord” type of mystery character will be introduced. During the events of the first 20 minutes, cockroach aliens storm their location and then a guy wearing a helmet and jacket comes to their aid. He’s been described as similar to Star-Lord of Guardians of the Galaxy movies. Many fans are already theorizing that he may be Jack Flag, a minor Captain America-type character from the comics who somehow found his way into outer space, and even joined the Guardians. A blooper reel from season 4 was also revealed.